IBM and ARM wants to make everything smart! 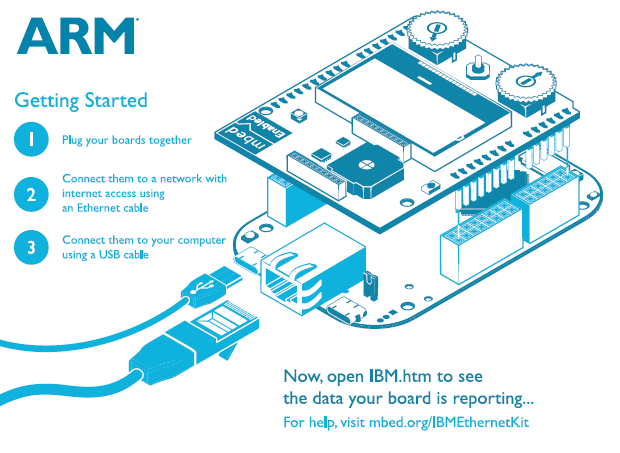 To give a push to the ‘Internet of Things‘, IBM and ARM have announced a joint project for launching a starter kit with cloud support, as per the sources. A ‘starter kit’ designed to take the Internet of Things to a new level has been announced by two leading firms – cloud services giant IBM and chip designer ARM. According to them, it will take only few minutes to unbox the kit and send readings to online apps. This could be a huge step towards smart cities, smart homes and other prototypes using the technology. The ARM embedded kit will let users create cloud-ready products that could receive as well as transmit data for alerts. In further revelation of information, the kit is expected to arrive with ARM’s mbed OS that will connect into BlueMic Cloud of IBM. With these main specs, the kit will assist developers or users in the development of apps and services based on Internet of Things. The kit will be helpful for both experienced and non-experienced enthusiasts so that they can design and make useful apps. What they are offering with the new Starter Kit? As discussed on ARM’s product page, the official name given to the new starter kit is ‘IoT Starter Kit – Ethernet Edition’ and it’s based around the Freescale K64F platform and a Cortex-M4 processor. The processor comes with an integrated floating point unit and DSP. The site also discussed about some more features which includes that the chip is clocked at 120MHz with 256KB of RAM and flash of 1MB. Krisztian Flaunter from ARM said, “Securely embedding intelligence and connectivity into devices from the outset will create cloud-connected products that are far more capable than today.” This simply indicates that the main idea is to enable small companies to get involved in prototyping and device testing. Open IBM.htm and you can see the data reported by your board after connecting them to your computer. For more info, visit here. Looks like the tech companies are pretty serious about bringing together the physical and digital worlds. This will help connecting everything together and share rich information about their surroundings. This entry was posted in Hardware, News and tagged ARM, ARM embedded kit, ARM mbed OS, BlueMic Cloud, boards, cloud-connected products, connecting everything, device testing, embedding intelligence, Ethernet cable, IBM, Internet of things, IoT Starter Kit, new starter kit, Prototyping, USB cable by A Sidhu. Bookmark the permalink.